Felt has been around forever, and is cited as being one of the world’s first textiles. From my own experiences I know felted wool to be a most incredible product. It’s super strong while being lightweight. It naturally holds in heat, yet also keeps cool by insulating against heat in the summer and hotter climates. And it wicks away water. 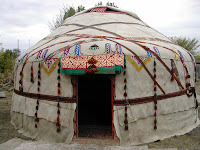 So no wonder felted wool has been found in history since 6300 BC from Turkey to China in the form of clothing, blankets, rugs and Mongolian tents known as “yurts” (see photo to the right, courtesy of Wikipedia). Felt has even been a part of the Ancient Roman Soldier’s battle garb, found in the breastplate as a way to deflect arrows. My favorite story of the evolution of felt as a useful textile is that of Saint Christopher, who, while running to escape persecution, packed his boots with wool to protect his feet from blisters. 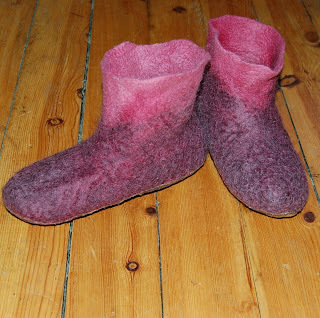 The result was a nice felted bootie perfectly formed to his feet. I love this warm and cozy image as we head into the cold winter months! Here's a modern day example created by the wonderfully talented felt artist ingermaaike. Be on the lookout in 2009 for more articles from me on the history and process for various felting techniques!